Abul Mumin chose to build his mosque adjacent to the main street of booksellers to emphasize the importance of reading and learning as the main source of progress, hence the origin of the name "Kutubiya". By the 12th century, most of the Maghrib (the Islamic countries of North Africa) was conquered by the Almohads, a dynasty founded by devoted religious leaders calling themselves Al-Muwahhidun: the proclaimers of the oneness of Allah. The name also has a political meaning: "the uniters", a title which gained them a lot of support. Renowned for their religious devotion and military organisation, the Almohads, after the Almoravids, the previous dynasty which reigned on Morocco, managed to pacify North Africa and played a prominent role in delaying the Christian conquest of Muslim Spain. They defeated various crusading campaigns, especially against Alfonso VIIIth (1158-1214) at Alarcos, and at Las Navas de Tolosa. Indeed, following the collapse of the Almohads in late 13th century, much of Muslim Spain was then conquered by Christian armies. The cultural attainment of the Almohads was also impressive, supporting two of the most renowned scholars of the medieval world: Ibn Tufayl (d.1185) and Ibn Rushd (Averroes, 1126-1198). Their rule reached its zenith under Yusuf Yaqub and Yaqub al-Mansur who developed trade and constructed a powerful naval fleet that challenged the Italian dominance of the Mediterranean. There are accounts which refer to this fleet being sent to the Syrian coast to assist Salah al-Din al-Ayyubi against the crusaders. The Almohads built many cities and founded a number of impressive monuments, especially in their capitals Marrakech and Seville. The Kutubiya Mosque in Marrakesh, their first key monument, was built by Emir Abdul Mumin in 1147, the Almohad ruler who took over after the death of Ibn Tumart (1080-1130), the founder of the dynasty. With his wisdom and patience, Abdul Mumin (1130/33-1163) managed to unite the divided North African tribes, Zenata, Snahaja, and Masmuda, whose differences and disputes intensified towards the end of the Almoravid rule. He also defeated the Almoravids in Oran (Algeria) in 1145, and Marrakech (Morocco) in 1147, ending their 100 year rule over North Africa. To celebrate this victory, Abdul Mumin chose to build a majestic new mosque in Marrakech, the capital of his defeated enemies. The victorious leader soon extended his rule into Spain and then Tunisia and Libya. Figure 1: Plan of the Kutubiya Mosque. The word "Kutubiyyun" is a Moroccan name for book makers/merchants who set up their bookshops, libraries and printers in a district of 12th-century Marrakech. According to Leo African, the area consisted of a street containing some 100 bookshops and libraries, 50 on each side. This activity reached its zenith during the reign of Yaqub al-Mansur who constantly encouraged the spread of book printing and promoted learning generally. Historical records recount how one day a celebrated literary man named Ibn al-Saqr, during the 8 months siege of Marrakesh, left his house to buy some food for his hungry family and ended up spending all his money on buying a book instead. Abdu al-Mumin chose to build his mosque adjacent to this street of bookshops to emphasise the importance of reading and learning as the main source of knowledge, hence the origin of the name "Kutubiya". It is worth remembering that there has always been a strong relationship between mosques and booksellers. Both shared in the passion for knowledge, with the mosque being the main learning centre and bookshops providing books and teaching materials, and they were therefore traditionally located side by side. The Kutubiya was first built in 1147 CE with 17 aisles running perpendicular to the Qibla wall. It was, however, destroyed a few years later, most probably because of its incorrect orientation towards Makkah. In 1158, it was rebuilt, immediately adjacent to the previous site, in its original form but with a corrected orientation and the addition of a minaret. The building consists of a rectangular hall enclosing the prayer room (sanctuary) and the courtyard. As with the original mosque, the 17 aisles of the new Kutubiya hall run from east to west meeting the Qibla wall at a right angle, reiterating the T plan seen in the great mosques of Al-Quds, Kairouan and Cordoba. The central aisle (nave) was made substantially wider and crowned with six cupolas. At the mihrab (niche) area there is a large aisle roofed with five domes of Muqarnas and running from north to south which intersects with the Qibla wall. The multifoil and fest arches framing these aisles provide the main decorative theme in the mosque (See figure 1). This was enhanced by the skilful use of light and rhythmic graduation of its depth creating a warm atmosphere . Archaeological surveys made by French scholars confirmed what was reported by a 14th-century Andalusian writer in the book Al-Hulal al-Muchwiyya (dated 1381/2) that Abd al-Mumin added a maqsura (a screen which encloses the area of the mihrab) to the mosque which he connected to his Palace with a vaulted passage. The builder was a Spanish Muslim from Malaga called Al-Hajj Yai’sh, who was also behind the construction of the fortress of Jabal al-Fath (Gibraltar) in 1160. The author also reported that Abd al-Mumin brought to the Kutubiya a minbar (pulpit in the mosque where the imam (prayer leader) stands to deliver sermons) made in Andalusia of pieces of wood from Khmer, red and yellow sandalwood and gold and silver ornaments. This ivory-inlaid minbar does in fact have an inscription which states that it was carved in Cordova . Such objects highlight the cultural and artistic exchange between Andalusia and North Africa. The court of the mosque is an open area in the southern side of the hall surrounded by arcades made from extended aisles of the sanctuary. In the north-western corner, the famous Kutubiya minaret stands, over 67m high, showing the religious devotion of the dynasty. 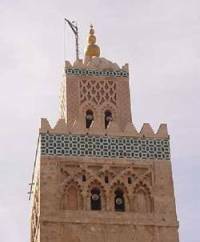 Sources indicate that a Moroccan named Jabir was the architect of what was to be the prototype of the famous Almohad square Minarets, which reappeared later in the Great Mosque of Seville (1171), Hassan mosque at Rabat (1195/6), and at a later stage in Mansurah Mosque at Telemcen (1333-36) . Figure 3: The top sections of the minaret received special care, here showing details of intersecting lobbed (multifoil) arches in the lower section and the Shabka (net) scheme in the upper section. 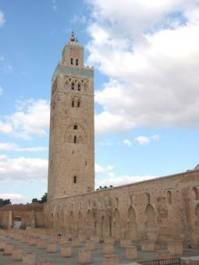 The Kutubiya minaret has plain slender edges that serve to dematerialise their bulk. The decoration on surfaces varies on each side. The single or double openings are framed by a variety of lobbed, interlaced and festooned arches employing semi-circular and horseshoe shapes. The decoration starts from the simple plain lower sections, mainly in the form of frames decorated with two lobed windows and an adorned arch, becoming more complex towards the top where an intersecting multifoil arch decor system (known as Shebka) adorns the top sections. The Kutubiya mosque represents a unique example of the conceptual unity of style that is rarely found in North African Islamic architecture. Its importance is further emphasised by the scarcity of monuments of this period. The mosque can be considered as the workshop where Almohad art and architecture first developed. Meanwhile the integration of architectural forms in the decorative scheme was another achievement attributed to the mosque. Another feature that needs to be highlighted is the unusual absence of any signature identifying the founder of the mosque. Emir Abd al-Mumin seemed to reject leaving any traces of his name on the building, although this was a common practice of the period. If it was not for good historical records, he could have remained anonymous, an act which can only be explained by the religious devotion of this great Almohad leader. Al-Murabitun in Arabic, meaning defenders of the faith. Note that printers during the 12th century were no more than editors manually writing and rewriting various manuscripts (Nashakhun). Leo Africanus (c. 1494 – c. 1554? ), of whom the real name is Al-Hasan ibn Muhammad al-Wazzan. He was an Andalusian diplomat and author who is best known for his book Descrittione dell’Africa (Description of Africa) describing the geography, history and culture of the African countries he visited. More recent stories reveal that in 1766 the Moroccan king ransomed some Christian prisoners with books stolen by Spanish pirates from the famous Library of Ahmed Al-Mansur. Meuni, J., Terrasse, H.and Deverdun, G.(1952), 'Recherches Archéologiques à Marrakech, Paris., p. 47, n. 4. See our article: The Architecture of the Muslim Khilafa in Spain and North Africa (756-1500).